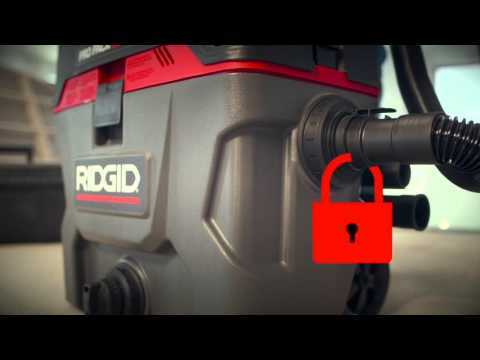 The RIDGID® Model 1000RV professional wet dry vac is the ultimate wet dry vac for contractors. This 10 gallon wet dry vacuum features a unique, toolbox design for portability and easy storage with accessories and power cord storing inside compartments on the vac. The extra sturdy cart allows you to wheel it right through the door and to the job, and the 5.0 peak HP motor provides the required suction power to tackle most messes. Powerful 5.0 Peak Horsepower - High performance wet/dry vacuum. Longer motor life - Durable, long-lasting motor backs industry’s best warranty. Telescoping Handle and Large Rear Wheels - Provide easy transportability. Accessory Storage - Storage compartments keep hose, wands, 20' power cord, and all accessories organized and close by for quick access. Blowing capacity - Use to blow leaves from walkways or decks, and debris from job sites, tools, etc. Qwik Lock® Filter Fastening System - Makes installing or removing your filter quick, easy, & secure without tools or fasteners. 10 Gallon Wet/Dry Vac is rated 4.3 out of 5 by 24. Rated 5 out of 5 by denowen33 from Awesome vac This is one powerful sucker. Works great for a lot of dry uses, haven't used it for wet yet but hopefully I won't need to. Using vacuum bags makes clean up super easy. Rated 5 out of 5 by eduda from Great vacuum for the size I down-sized from a 60-litre Craftsman, thinking that I'd soon regret the decision. No such thing!!! Powerful, sturdy, doesn't turn it;s nose up at anything thrown at it. Wish it came with more attachments, but those are easily had at Home Depot for a nominal fee. If you need a new shop vacuum, don't hesitate getting this one. Rated 4 out of 5 by Stacker from Light weight lots of power The product I bought is great , but I have ridgid drills the batteries are no good didn't last a year , lost my warranty slip back when I bought it my fault ! How do I go about getting some new batteries it doesn't pay me to buy them . I'll just buy another product from some other company . I have all ridged products! Rated 3 out of 5 by Naed18 from Product overall is ok for its price point, I hope the motor does make it to the end of the warranty, the wheels won't ! Wheels are narrow & small , they wear fast, decibel level is high, good suction , there are not enough smaller hose ends , needed to recycle an old one for use on corners & such !, the other fittings work well & good size of hose ! Rated 3 out of 5 by Tara from No narrow nozzle comes with vac Registering the product for warranty purposes is always a challenge with Rigid. The email from Rigid to do this survey will be my way to prove I registered the product as I received no verification from Rigid itself. Rated 3 out of 5 by TrueNorthRealist from Design improvements needed. The hose is to short. The cable is to short and to low of gauge. The tools are to poor in quality, especially the duster. It looks good and it was cheap. I bought it because of price and need of a vacuum. Rated 4 out of 5 by kitty2 from This vacuum is compact yet powerful. I bought it to use with the cyclone originally, so I did not need a super huge drum. I like the feature that I ca I bought this vacuum to use with a cyclone so I needed only a powerful suction but not a big drum since the bucket of the cyclone will being holding most of the junk the machine picks up. Unfortunately the size of the hose does not fit very well with the cyclone, so I use it mainly as a blower; the performance, nevertheless, is satisfactory. Rated 5 out of 5 by Homespun from I love the tool storage is at your fingertips. Great mobility, ease to use and super powerful. I love it! Rated 2 out of 5 by HAHH from BAG SYSTEM DIFFICULT TO USE Unit has lots of suction. However, the bag system us difficult to install in the machine, difficult to inflate, and therefore of no use to me. Floor brush does not pick up very well, it just pushed or pulled the debris around on the floor. The hose is so inflexible it is difficult to keep the floor wand where I wanted it. I anticipate the plastic connectors (motor unit to barrel, extension tubes to hose) are not durable and will not last too long. Rated 5 out of 5 by scroller from Sturdy product The power is awesome the power chord sufficient in length the only problem I am running into is that the plastic wand doesn't connect very tight and keeps separating while I am vacuuming. I hope this company has service like Shop-vac I recently needed a switch for my shop vac and they sent me a whole upper unit. Rated 5 out of 5 by mrsmel from This product is very easy to use and does a great job! I am an 80 year old lady and can maneuver this vacuum so easily. It sure gets the job done with little effort. Rated 5 out of 5 by DanLaurieWA from This product does the job. Bought the vacuum to help control the mess while finishing our basement. Have purchased additional attachments to clean up dust, Remove debris from woodwork prior to staining and just to contain the messes in general. It is done a nice job at all we have asked of it so far. Rated 4 out of 5 by guanajuato from works well I bought a 4 gallon wet/dry vac!!! The registration did not have a product of 4 gallons!!! What is wrong. Hope the vac is better than you on line registration!